Can Horne extend his lead at Dezzi Raceway? 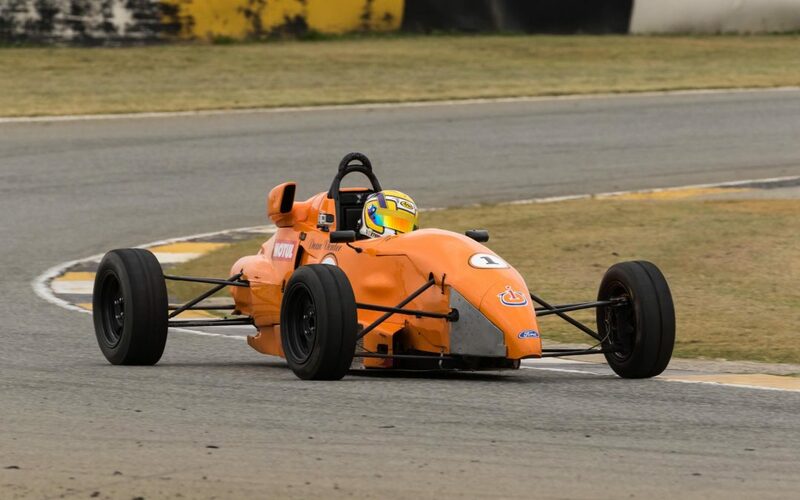 After a break of almost 3 months, the 2018 Investchem Formula Ford Kent championship gets back on track when more than a dozen drivers make their way to the KwaZulu-Natal south coast for the fourth round of the series which takes place at Dezzi South Coast Raceway on Saturday, 11 August. Multiple former champion Andrew Horne (Xena Chemicals / Budd Power van Diemen) has won four of the six races held so far this season and leads the championship standings, albeit with a slender seven-point margin. David Jermy (Beauty Factory van Diemen) had a slightly disappointing outing last time out at Phakisa but still leads the chasing pack, six points ahead of defending champion Dean Venter (TEU Southern Africa Swift). While the top three in the championship will almost certainly be fighting for the win at Dezzi, they certainly won’t have things all their own way. Jonathan Nash (Turnfab Engineering Swift), Alex Vos (Ecurie Zoo Swift) and Jeff Gable (Beauty Factory van Diemen) have all finished on the podium this year and can challenge the championship front-runners. James Reeves (Ray) hasn’t had a great start to his season and will be hoping the trip to the coast, where he ended up third overall last year, will get his season back on track. Steve Venter (TEU Southern Africa Swift) and Dalan Holton (Debella Finance van Diemen) will also be out to grab as many points as possible around the tight 2.5km circuit. Matt Nash, in addition to his normal car preparation role, will also be behind the wheel at the circuit where he grabbed pole position last season. Graham Vos (Ecurie Zoo van Diemen), Paul Manegold (Tiga) and Zac Edwards should also be on the grid. As usual, Friday will be dedicated to practice sessions with the 15-minute qualifying session getting underway at 08h00 on Saturday. The first of the two 10-lap races will get underway at 10h50, with race 2 scheduled to start at 14h35.